You’ve arrived in Morocco – now the question is how do you get between point A and point B. 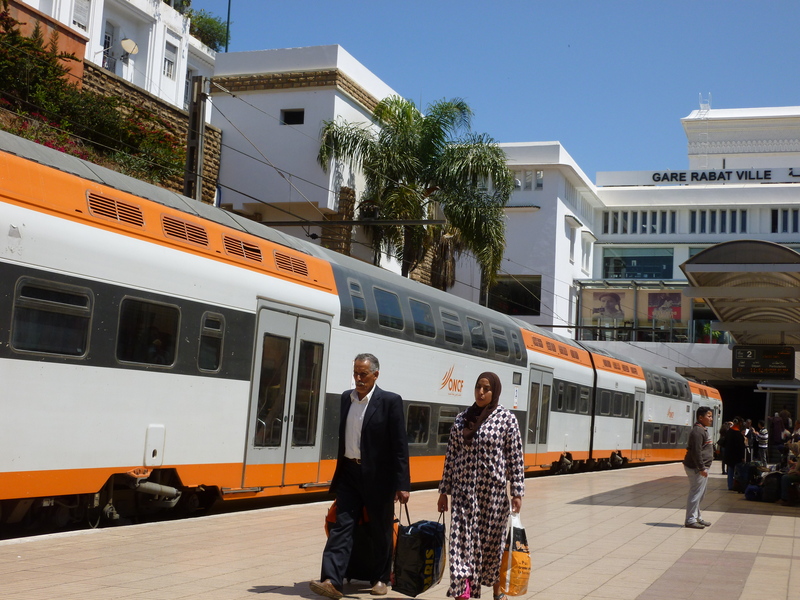 Good news for you – Morocco is developed enough to have multiple forms of transport. The best form of transport is of course a train – in my humble PCV opinion. There are options for first and second class. First class is VERY expensive on a PCV budget basically double the price of a second class ticket. So if I were to travel between Rabat and Taza a second class ticket costs 111 Dh – ($13.87) – it would be 222DH ($ 27.75) for a first class ticket. First class does guarantee you a seat and working A/C in the summer. 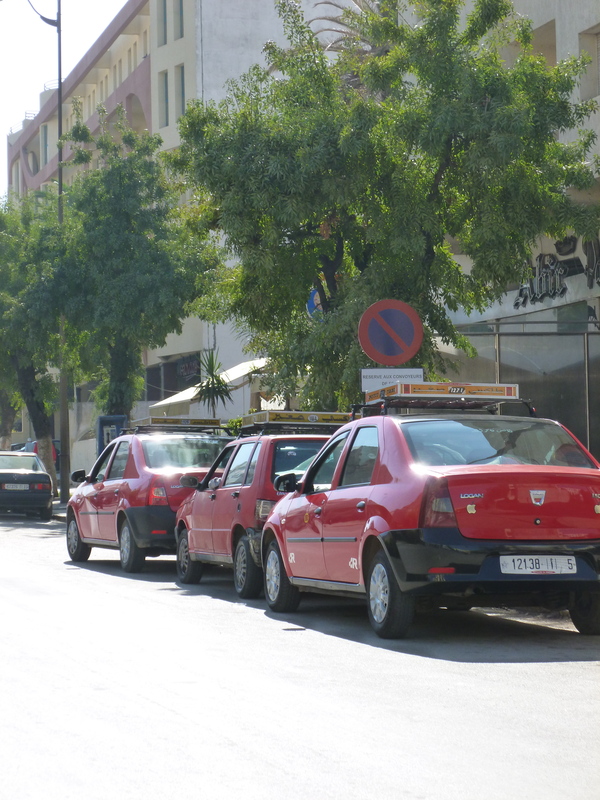 This double decker type of car is used for short commuter distances between larger and smaller cities – Ex Rabat and Skhirat. 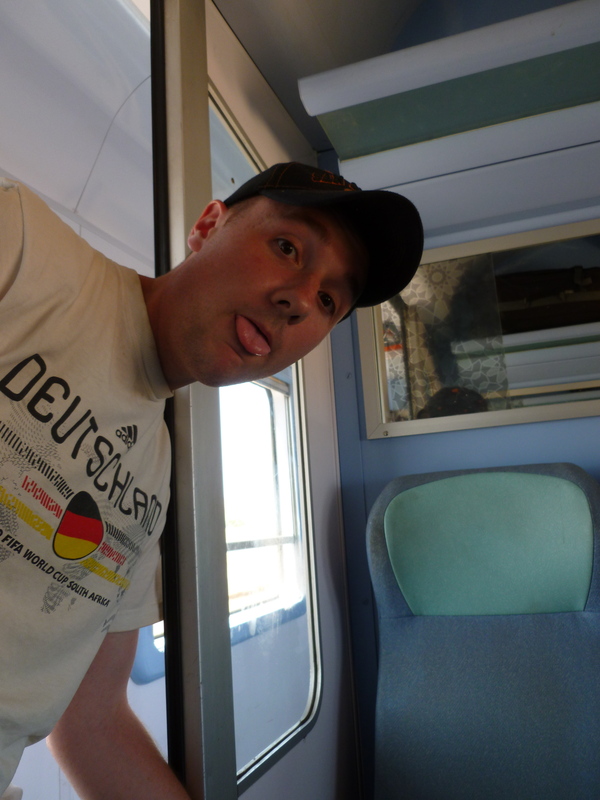 Expressing just how hot it was in the 2nd Class compartment on our trip. 1. Be prepared for the men who will light up to smoke in the compartment or between cars. The doors do not always stay closed and you will be exposed to second hand smoke – no matter that ONCF – has a massive non smoking campaign going on – its not enforced by the train staff and there are no fines imposed – which would drive the point home for many Moroccan smokers. – A cup for the water – if it’s a Moroccan woman usually a mom – she ALWAYS has one. – Food – As PCV’s we use this time to eat junk food we can’t get in our sites or if we can as an excuse to eat junky food. – A plastic bag – its has a 101 uses including storage, a toilet and rope – just based on my experience. – Book/ Newspaper/ Kindle – Lead by example and read in public for enjoyment – its rare here in Morocco. – A fake wedding band set – to ward off harassment from Moroccan men. 3. Pay attention to your stops – No announcements are made generally speaking – and so you need to look out the window and ask people – if its your stop. 4. Keep luggage in your line of sight and keep in mind you will have to carry the luggage on AND off train. If your luggage is larger than a hiking backpack or a carry on size piece you will have difficultly find space for it on the train’s overhead rack. 5. If you sleep on the train – only do so if you have a travel partner who you can take turns sleeping in shifts. However depending on harassment levels – you may need your travel companion awake the whole trip. ** Note – if your traveling with kids – its much better in Morocco to do so without a stroller and instead use a carrier like an Ergo, Beco, Boba or Diymos wrap. It leaves you hands free able to get in and out of transport much easier. If you chose to use a stroller go with something rugged and lightweight! Buses – A dicey choice but second best to the train. So the most generally reliable bus company is CTM. CTM – They assign seats, charge 20Dh for luggage which should really be include in the price of ticket and assign seats. Not to mention they are uptight about making sure you sit in your assigned seat. They are also more expensive because they are so strict about enforcing the rules. So if you need to ship luggage – CTM is the way to go. I had the experience of trying to buy my ticket in Taza before the CTM bus arrived in Taza and was told all the seats were sold although I had come the day before and tried to purchase my seat – only to be told that wasn’t possible. I also had a difficult time in Al Hociema getting a straight answer about luggage pick up and cost after not paying on my ride between Taza and Nador for luggage. The “Souq Bus” – this refers to independently operated and owned buses that transport people, goods and luggage between different areas. The difference between CTM and a souq bus is that CTM services their buses regularly, has a limit on the number of passengers because of sticking with assigned seats and doesn’t allow live stock on the bus. Its not uncommon to take on one of these buses and find yourself squished between a chicken, a person and a goat. Fairly often as many people can be pushed, shoved or squeezed in are put on the bus until “capacity” is met thus creating a unique and often unsafe travel experience. Watching your luggage is critical on one of these trips – as luggage can be stolen at the different stops – so I would highly recommend – getting off the bus observe the luggage and getting back on the bus once the luggage doors have closed to prevent you luggage being stolen. If you don’t know where the bus station is for souq buses ask a local hanut owner to direct you to the station. 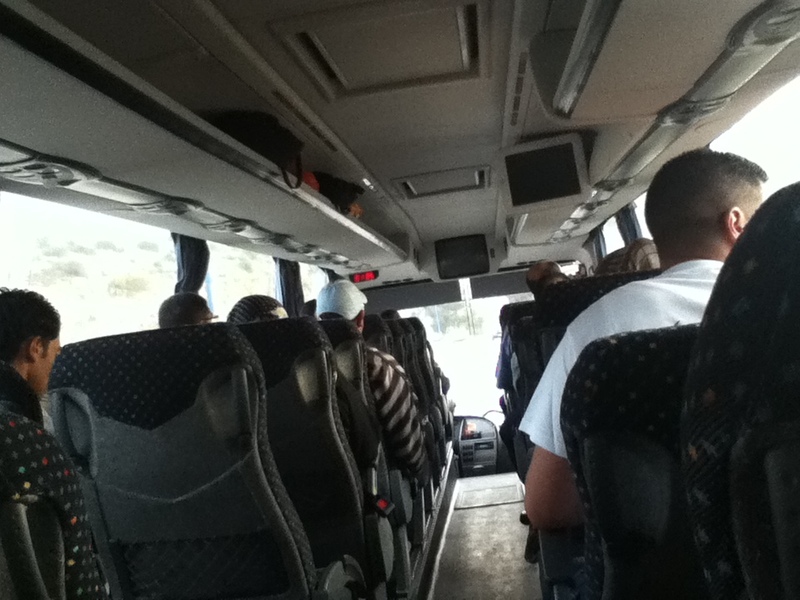 All of travel tips for the train – apply to bus. Although be aware – no toilets on the buses – so if you have to go – do so at a stop but make sure to get back to bus before it leave you behind. Grand Taxis- Sardine in A Can – Human Style! Grand Taxis are old Mercedes Sedans that were purchased in bulk by the King of Morocco a long time ago – maybe the 1970 -60’s. Grand Taxis serve the purpose of transport between cities and to rural areas outside of cities. Typically in America such a car would hold 5 people but in Morocco the magic number is 7 but maybe 8 with a child or a baby riding on someones lap. The price of seat in Grand Taxi depend the level of Darija you have, where you are going, and how long you have wait till the taxi is full. If the driver gets impatient you could end up paying for the whole taxi or more seats than just yours. Generally speaking a Grand Taxi ride costs between 10 DH and up per seat. So its best to ask around with other people about what the cost of such ride is generally speaking – so you don’t get ripped off. 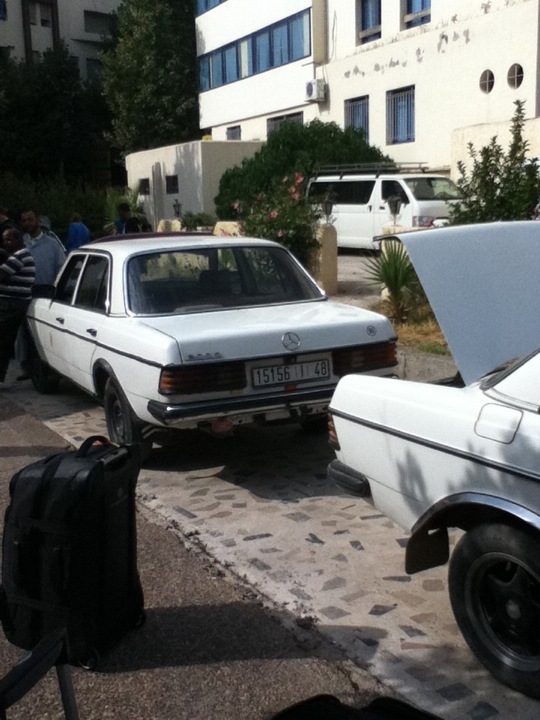 Also be aware different regions have different colored taxis – Nador has blue Grand Taxis while Fez has beige. Each legal taxi has a number on the door and a red circular tag attached below the bumper. Petit Taxis are the main transport in cities if you can afford it. Make sure to note the number of your taxi – in case you forget anything. That way you can get it back – InshaAllah! Just like Grand Taxis different cities have different colored Petit Taxis – Fez has red as its color – while Taza is Sky Blue. Also depending on what city your in – the taxi will have a meter – make sure to ask them to use the meter so you don’t get over charged although for example in my site in Taza – there are no meters in the taxis- All Taxis charge 6DH for a ride anywhere in the Upper or lower portion of the city except for trips to the Train Station or the Marjane – then they charge 8DH and might ask for more depending on the size of your luggage. The price also doubles at night – so try to plan to do most things during the day! How to get a petit taxi – You indicate with you fingers how many passengers for the trip – once your on the right side of the street for the direction you want to go. The driver pulls over if your lucky – and you state your destination. If he wants the business – the driver motions you to get in and if he doesn’t he shakes his head – says no – my final destination is X. Goodbye and pulls off. Sometimes are harder to get taxis than others – such as at night, right after the call to prayer and on souq days. Smoozing with your taxi driver – can lead to offers for hanging out at the cafe, watching a soccer match and sometimes a lower price for the ride. I know many PCV’s who have specific taxi drivers personal numbers – so that they can call when they need a ride at an unusual time or they don’t want to wait and try and get a taxi the usual way. So good luck and happy traveling in Morocco! It is so difficult for Non moroccans to travel in Morocco. Unfortunately, its a shame. I do not get any sort of harassment. its 1% chance i would. But when i am in Morocco i make sure to dress more appropriately too. SO i wear Full jilbab and no fancy colorful stuff. Also helps if you ignore men, do not smile and if they talk to you just ignore them and look away. They will not pursue you if you ignore them and show dissatisfaction and disgust. If you smile, giggle, or act shy then you will be harassed like anything.